Patti Blagojevich appeared on FOX's "Tucker Carlson Tonight" on Monday, a network President Donald Trump has openly said he's likely to watch. After the U.S. Supreme Court chose not to hear her husband, former Illinois governor Rod Blagojevich, appeal his corruption sentencing, Patti said they will have to find another way to secure her husband's freedom. "If you could speak to the president, what would you say?" Carlson asked Illinois' former first lady. "What would be your pitch to pardoning your husband." Blagojevich said she was "disappointed." Former Illinois Governor Rod Blagojevich was hoping the Supreme Court would agree to hear his appeal of his convictions, but was denied Monday. NBC 5's Phil Rogers has the details. The high court was a final legal appeal for a chance at freedom, tonight an 11th-hour effort by the incarcerated former governor's wife. "My husband probably is the only person in U.S. history who got sentenced for asking for campaign contributions," she told Carlson. Monday's Supreme Court announcement marks the end of a legal roller coaster that basically guarantees Blagojevich will stay in prison until 2024. "He never took bribe or kickbacks, never made promises to contributors for acts," Patti Blagojevich. "Never took gifts, trips, cars, watches, that other governors have been convicted of, yet he serves sentence twice as long as anyone else." Trump and the former Illinois governor are tied to reality TV from Blagojevich's stint on trump's celebrity apprentice show in 2010. The president could commute the sentence to time served. Former Illinois Governor Rod Blagojevich is hoping the Supreme Court will agree to hear his appeal of his convictions. NBC 5's Phil Rogers has the latest. Or he could grant a full pardon as he did last week for former vice presidential advisor, Scooter Libby. The high justices didn't comment on why they didn't take the case. 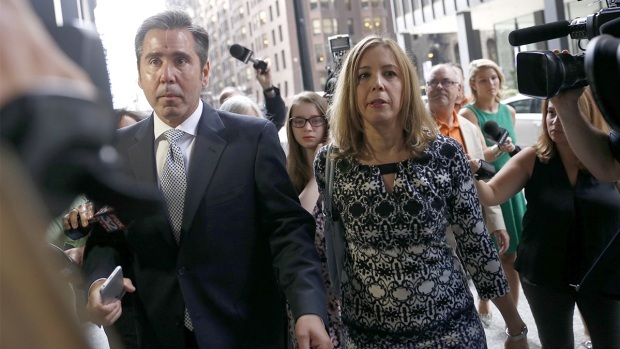 Blagojevich has just begun his seventh year of his 14 year sentence. He remains at a Colorado prison, where Patti says she and their two daughters speak to him by phone every day.